Most of us have heard (perhaps ad nauseam) the story of Abraham Lincoln’s recurring dream about hearing people sobbing in the White House and finding that he has been assassinated. He also reported an incident where he saw his doppelganger in a mirror—looking pallid and sickly—a portent of death. 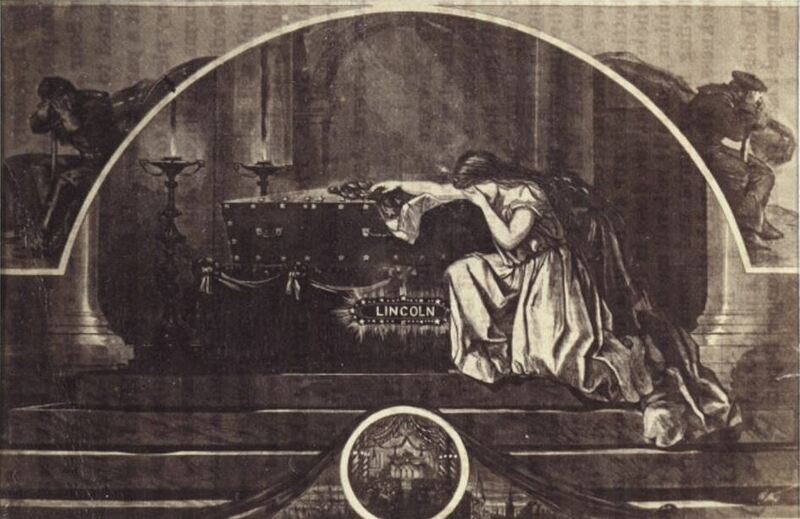 As we did with predictions of the doom of the RMS Titanic, let us look at some lesser-known omens of Lincoln’s death. There was another recurring dream that also presaged disaster for Lincoln. Here is an early mention of the dream, by the prosecutor in the John H. Surratt trial, Edwards Pierrepoint, who cited it in his arguments to the jury. On the 13th of April, 1865, Abraham Lincoln called together his cabinet. He was in good spirits, for, as you well remember, we had at that time been receiving the most gratifying and cheering news; but still upon his soul there lay a heavy gloom, and he remarked, “I am very anxious to hear from Sherman.” The reply was, “You will hear good news from Sherman. There can’t be any doubt about that.” General Grant was there, and he knew Sherman. He took occasion to assure the President that the news from Sherman would be all right. I don’t know,” replied Mr. Lincoln, and then repeated what he had before said, “I am very anxious to hear from Sherman,” adding the remark, “I feel some great disaster is coming upon us. Last night I was visited by a strange dream, the same dream that in the darkness of the night, when deep sleep had fallen on men, hath three times before visited me. Before the battle of Bull Run, before the battle of Stone river, before the battle of Chancellorsville, it came to me, and the following day came the news of the disaster. This same dream came to me last night in my sleep, and I feel as if some great calamity is to befall the nation, in which I am to be personally affected.” The members of the cabinet who heard that will never forget it. In a few hours afterwards (a pause) he did not hear from Sherman, but the Dream came again and led his spirit up to God who gave it. SIR M. E. GRANT DUFF, in his “Notes from a Diary,” tells the story as follows. It was told to the author by Charles Dickens, who had it from Stanton, the Secretary of War. Dean Stanley, who had also heard Dickens tell the story, corroborated the accuracy of the present version. Stanton had been called to a Council at the President’s, but arrived somewhat late. He replied, “I’m alone — I’m in a boat, and I’m out on the bosom of a great rushing river, and I drift, and I drift, and I drift.” At this moment came your knock at the door. The President said, “but this is not business, gentlemen. Here is Mr. Stanton.” Five hours afterwards Lincoln was assassinated. The medium Daniel Dunglas Home was said to have predicted Lincoln’s demise and the attack on his Secretary of State, William H. Seward. Mrs. Milner Gibson was a well-known Spiritualist, and Light, May 21, 1881 mentions a visit of Home to Mr. and Mrs. Milner Gibson’s when the medium rose to the ceiling. However nothing is said regarding Lincoln or Seward and I cannot find any mention in Home’s own work about this prediction. The following was repeated verbatim in various publications, but so far I’ve not located another source. Amongst the number of mediumistic predictions connected with the great American war must be reckoned the warnings which the unfortunate Lincoln received touching the danger which threatened his life. The tragic end of this great man had amongst other things, been predicted a long time in advance. In 1863, in the month of August, Mr. Home being in the trance condition at Dieppe, at the house of Mrs. Milner Gibson, wife of the English cabinet minister, foretold the events which befell the victims Lincoln and Seward. This fact was attested at the time by the witnesses present. Mrs. Gibson told us of it some days after. Revue Spiritualiste. Surprisingly, not many clairvoyants claimed after the fact that they had predicted Lincoln’s assassination. There was a Mrs Gail from Chicago and Boston’s Professor Thomas Lister, “astrologer.” He advertised himself as a “seer” as early as the late 1840s and, in 1874, boasted that he had been 42 years in practice. Well, I did refer to the files of the Boston Herald for that date–in vain. Throughout 1864 Professor Lister, Astrologer and Botanic Physician advertises a Brief oral, 50 cents or a few questions answered by mail for 50 cents in stamps. A written Nativity for three years to come $1; all through life, ladies $3, gents $5. His ads appear punctually about every two weeks. But I saw no prediction letter and my databases do not cover that exact date. We might assume that the Professor also was counting on his 1875 readers not having the correct back issue. However, this next item may bring us a little closer to the actual prediction. Not exactly spot-on—the “evil transit” did not pass away—but predicting the end of the War in April 1865 is pretty good.